← Who’s Sending the Storms in Your Life? Spiritual Visions! Real or Fantasy? (Ver 1.5) This is now Part 2 of a series of important Bible lessons on the subjects of spiritual truths and realities. 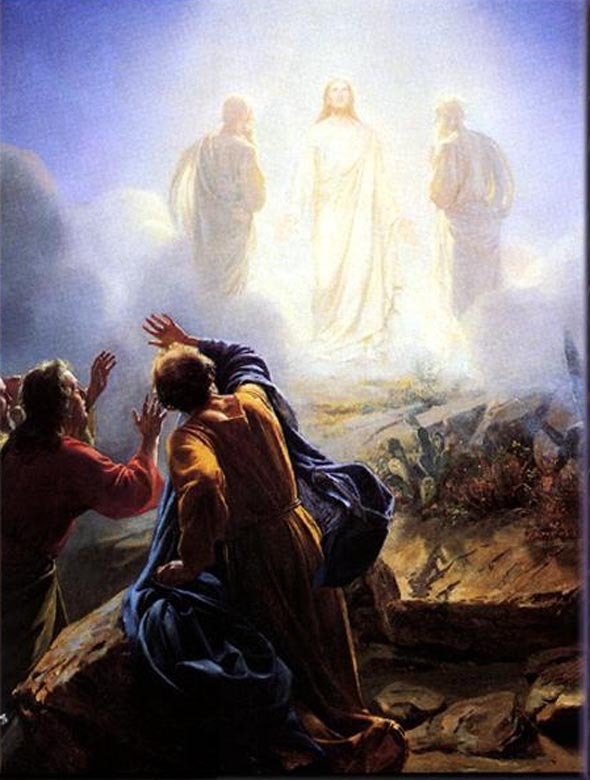 I had a reader try to tell me that the story in the Bible about Moses and Elijah appearing with Jesus on the mountain top was a vision that Peter, James and John experienced and therefore in a vision anything is possible. The entire context of his message comment was an attempt to explain away the reality of the existence of spiritual beings after their physical/natural death. These types of people are simply very ignorant and deceived by the devil into believing lies. They do not want to believe that people are spiritual beings that exist after death because they would rather believe that they go into a state of unconscious sleep until judgment day comes and God awakens them. They are attempting to justify their deception of the false “soul sleep” theology by explaining away what the Bible actually says on the subject either directly or indirectly. This is a common ploy of deception used by Satan, either ignore those things in the Bible that do not conform or fit with your version of the truth, or attempt to explain them away using your limited intellectual knowledge and human reasoning. There arises a great problem with this type of wrong thinking. We can easily find verses that contradict a soul sleep belief. People, without understanding what they are saying believe that my God was and is a willing participant to visions with lies of deception being embedded within them. They said that God can give people a vision of anything, like fairies, monsters, fantasies, imaginary figures or whatever simply because He likes to teach us something and it would be OK and acceptable for God to behave this way since He is clearly the sovereign God. All of his comment was a response to my explanation of “Is there Life after Death for Seeing Spirits” lesson that was recently written on that important subject. If you have not read this lesson you should go back and start with that lesson first, because I will not repeat any of it here. Because these people want to believe you go to sleep when you die, they try to explain away Moses and Elijah appearance with Jesus as a vision fantasy. Today’s lesson is on the subject of visions and it is directed at those who want to know the truth. So today’s lesson is about the subject of spiritual visions and what they are! God will further discuss today in this lesson the purpose that His vision are given to people. We will learn today that there is more than one kind of spiritual vision. We will also discover that there are other types of a vision possible for other purposes. We will research and discover the truth using the Bible and ignoring the words of deceivers. According to the “deceived individual” a vision is simply an apparition or a fantasy of Biblical and Godly proportions where anything goes. So according to this person, God can communicate with people saying anything He wants to and even lie to them using a vision not found within reality. However, my Bible says that “It is impossible for God to lie” (Heb 6:18). In Titus 1:2 it says God cannot lie. Therefore according to written scripture there is absolutely no way that a vision from God can be a party to a lie or untruth in any way or form. Because people do not want to know the truth, they make up excuses to explain away the truth and they present them to fools who buy into them like they were eating candy. What a crazy mixed up world that we live in. It is just way too easy for Satan to deceive some people (Rev 12:9). So what is a spiritual vision? In order to understand something we need to define it first. A vision occurs when a natural man is given a view into the spiritual realm either past, present or future. A vision is not a normal human experience. A vision is most definitely a gift from God by His sovereign choice that allows natural people to see unseen spiritual things, places, events, angels and people. However, these spiritual things are never fabrications or fantasies because they are more real than the natural things that we can see all around us. God who is a Spirit (John 4:24), created the natural world as a pattern after the spiritual world that He already lived in. It was the Supreme God of the spirit world that created this natural world. The things that we perceive with our five natural senses are called the “Temporary” things of this world. This verse then contrasts the temporary things with the greater eternal things. What are eternal things? They are not natural things so they have to be supernatural things. These are spirits and the world that they live within. These are the eternal things and beings that God is comparing to natural seen things. Because people cannot see, feel taste, hear or smell the spiritual realm normally they do not believe that it exists. But, this is by God’s design and purpose not to allow man to know that he is a spirit being living in a temporary natural body, until after they are either saved or dead. Even after a person becomes a Christian they can still be a very “Carnal” Christian and still be flesh dominated. Heaven is a very real spiritual location and place and existed way before the earth and the natural universe existed. What I am going to do today is to use the Bible to show you God’s usage of visions and see what we can learn from them. By standing firmly only on the Word of God and understanding what it says, is our only hope for not being deceived like some of these people that try to write me crazy responses, like they were trying to help me not to be deceived. I have learned better than to ignore God’s truth in order to follow a lie, I know who my God is and I know what His Word says, so I’m going to stand with Him and ignore the opinions of people. So obviously God is lying to Abram and just telling him something He wants to trick him with. If you are spiritually blind this is what you might believe. If that is what you choose to believe then you might need to go read somebody else’s blog. What we can clearly see is that God holds a conversation with Abram in this chapter and informs him of what will happen in his life on earth and in the future to come. If you read the whole chapter you can clearly see that God gives Abram a covenant and reveals what will happen to his seed. These are spoken prophetic Words from God and not lies. There are no lies written here in this chapter because these are all of the true facts that will soon happen to Abram. God is not participating in a fantasy with Abram. It is very critical to note and learn the reason for the vision being given was for God to speak to a natural man named Abram. God did this by opening his spiritual eyes to see and hear something coming from the greater spiritual realm. God speaking to natural men with visions will become an established pattern of truth as we continue in this lesson. Please note that there is no other reasons given for the vision, do you understand this? Let’s look at another mention of “visions” in the KJV O.T. Bible. God clearly informs us of how He uses visions to communicate to His servants the prophets. The prophets of God would receive spiritual information directly from God Almighty in the form of both visions and dreams. Again we see the only reason for God giving a vision to a human man is for God to speak to them. This means it has to be the truth, if it is coming from God. So I brought up dreams because this verse mentioned that God also uses them to communicate with people on the earth. I do not believe that every human vision or dream can only originate only from God, after all there are other spiritual beings that are alive and well on this planet. I have heard people say in church that they saw someone who they thought was Jesus and he appeared to them, but what he said to them tried to make them do something that the Bible did not say or confirm. So that type of vision could be the possible deception of the enemy Satan. The Bible says that even Satan can transform himself into an “angel of light” in order to try to deceive us (2 Cor 11:14). The only reason why Satan would transform himself is to be seen in a visual form. This clearly implies a vision into the spiritual realm. Therefore, if you do not know what the Bible says, you are an easy prey for this type of deception. I will tell you this plainly that God will never tell you anything in a vision that is contrary or opposed to the written Holy Word of God. As you can clearly see in the above verse in Numbers 12:6, God uses visions to make Himself and His words known to people. So is God going to trick you with a false vision? Is God going to deceive you with a lying vision? Or is God going to speak ONLY the truth in a vision? What would make God known to us? I believe that only the truth is what comes from a vision from God for Him to make Himself known to us. So if Peter, James and John had a vision of Moses and Elijah speaking to Jesus was it fictional or real? I believe it has to be more real than anything we experience on the earth. The spiritual realm is not fictional, if it is, then God is a fictional character and I know much better than that. One of the key points to deception is to discredit the truth. Satan uses this ploy very often by inferring that God is the one that lies to people and that he is the one speaking the truth! This was his deception to Eve and he hasn’t come up with anything new for you either. There are more than one type of vision in the Bible and in fact there are at least two types of visions that I have found in the Bible. One type of vision I will call an “Open” vision and the other type of vision I will call a “Closed” vision. Let me briefly show you the difference between these types of visions using the Bible. For example in the book of Job God says the following. As you can clearly see in this verse, God is saying that I will come to you in the night while your body rests and sleeps, because you did not hear me during the day when you were awake and busy. When you are in a deep sleep, your mind is usually very quite, you are not busy moving or talking and you can more easily hear what the Spirit of God wants to speak to you. Why is this possible? It is only possible because your spirit inside our sleeping natural body never sleeps. Just because your body sleeps does not mean the real unseen you ever sleeps. Only deceived people believe that spirits can sleep. While your body is asleep and your mind is not preoccupied, your spirit can hear directly from God in a night vision or a dream. God says that He is able to open the ears of the man in the night sleep so that he is able to hear the instructions from God. This is an example in the Bible of a closed spiritual vision. There is a key word given to us in this verse, and it is “opened”. This does not mean that the man was deaf and was unable to hear physically. It is only talking about the spiritual ears of the man being opened so that he can hear with his spirit. This type of vision is usually very personal and it is God speaking directly to your spirit for normally your benefit only. I guess it is important to note that even in a closed vision of the night, God must open something in order for you to hear it or see it. An open vision is usually one that occurs with your natural eyes wide open. When this type of vision occurs to you the people around you usually do not see what God is showing you in the spiritual realm, they only see you in a trance like state of existence. You are usually the only one that perceives the message from God sent from the Spiritual Realm. This is a method of God that allows you to see into the real spiritual world and it definitely is not a fantasy event of any type. Open the eyes of my servant so that he can see that there are more for us than there are against us. To open your eyes, does not mean your physical eyes were closed or blinded, his physical eyes were seeing fine the natural things that they were faced with. What Elisha was requesting for God to do was to open his spiritual eyes to let him see into the spiritual realm in order to see that there were flaming chariots of fire all around them. This was an example of an open spiritual vision of view into a real set of angels of God riding in chariots of fire. These angels were not “make believe” and these angels were not fantasy; they were simply seen only in the real spiritual realm and this the truth from God. So people, who want to believe lies, can go and explain away these real spiritual things in the Bible with their human reasoning for other spiritually ignorant people to devour. I’ll wrap this lesson up for today with one final verse to consider. We have learned there are at least two types of visions, one open and one closed. We have observed that God’s visions are only given because God wants to speak truth to a natural man about things that he may not have been able to perceive otherwise. Now I want to briefly address a part of the subject that I alluded to earlier about false visions from other spiritual beings. Jer 14:14 Then the LORD said unto me, The prophets prophesy lies in my name: I sent them not, neither have I commanded them, neither spake unto them: they prophesy unto you a false visionand divination, and a thing of nought, and the deceit of their heart. God clearly tells us that He does not give anyone “False” visions so that they can preach lies to the people of God. Did you understand what God just said? Do you understand why and how this applies directly to the vision that Peter, James and John had? If the vision of Moses and Elijah was not real and the truth then it was a fabricated lie and must be called a false vision. This would be a deception that God says that He is not participating in. This verse clearly teaches us that God gives people only visions of truth and spiritual reality. God will not give anyone a fantasy vision, a fairy tale vision or an imaginary vision of fiction. That would make God a liar and this is not my God and never will be. People who want to believe lies will ignore vital scriptures in the Bible that conflict with their erroneous beliefs. These scriptures were placed there by God to teach us the truth and every scripture on the subject of visions must be balanced with the other scriptures on the subject. This is basic correct Bible interpretation. Only when we allow the Bible to interpret itself can we come close to actually understanding the truth. The next time anyone gives you a verse and tries to tell you that it is not a real vision from God of truth you should respond with the Bible. It is very interesting to note, do you know that it does not matter what you believe? It does not matter if you are right or if you are wrong? Wow, I probably just blew someone’s mind saying that. I guess I should rephrase those statements, because it does matter if what you believe is the truth for your salvation. But, what I meant to say was your version of the truth does not change the reality of the actual God given and intended truth. God is not going to change to fit and conform with your personal beliefs. God is not going to change His truth to align with your version of the truth. God is a constant, never changing, eternal God that only projects the truth in His word to those who want to see it. To those who are not interested in God’s truth, they are permitted to be deceived and follow their own misconceptions. This is the only way that God can give everyone a free will and a right to make a fair choice in this life. I had another confused reader try to ask me, why can’t there be multiple choices available to the afterlife? In other words he seemed to think that people are all so different in this current world, so therefore God will allow them all to be different in the world to come. While people will not be identically cloned robots in the afterlife and they will be completely unique we must understand that an anything goes moral mentality and the freedom to commit sin, will not be a direct part of God’s future plan. This type of thinking was the erroneous philosophy of an all-inclusive religion of tolerance and acceptance called “Universal Salvation” where everyone will be in heaven even if they never made Jesus their Lord here on this planet. I have other Bible lessons that address this so I will not repeat them here. But these are false lies of Satan also that will send people to hell because they think they do not have to repent and get saved. There will be no evil in the afterlife for those that are saved because there will be no tempter to test us. Satan will be cast into the lake of fire and will not be able to tempt anyone. God help us all to see the truth. If I were you I would become hungry and thirsty to know the real truth. Only by being open minded and examining the Bible closely to verify everything that you believe is true, can you ever be assured that you have not been deceived. If you are not willing to change when the truth is presented to you then you are in trouble. Pray and ask God to show you the truth, He is the teacher and will confirm to you the truth. Base your faith only on the Bible and not on anything that a man teaches. Thank you for taking the time to read and study the Bible and I hope this lesson will help someone to understand spiritual visions. God Bless! Posted on September 2, 2010, in Bible Study, Spirituality, Understanding and tagged Bible, Christianity, Church, God, Holy Spirit, Interpretation, Jesus, Prophecy, Religion, Revelation, Sspirituality, Truth, understanding. Bookmark the permalink. 6 Comments. I have a question…A few months ago, I had two visions about things that would happen and what my life would be like. A month later one of them came true, and it’s not something I had any way of knowing would happen. However, the other one I had… it seems no way of happening anymore. I’ve asked people and they said visions will only come to pass if life goes on a certain path. And if something changes in your life or the life of others, then it may not come true. Would God have any way of knowing the future or what would happen? Of course God knows the end of everything from the beginning Isa 46:10 says. Why do you think the visions were from God. I do not believe every supernatural vision is from God. Think about it. Satan is a false prophet. He counterfeits whatever is true with a fake. I do not know what the vision was or why you think it can’t come to pass. If you like to share I will read it. God Bless. Hello, I had a co-worker tell me about a vision he experienced several months ago and he is not sure if it was a vision from God or Satan. He stated ‘I feel that I have been given a vision from God, but is not sure if it is from God or Satan”. This visision took the forms of words written in the bible. The words were not in the scripture format. The words told him that he was a “hearer and not a doer” predicted that my family members would be in prision, and and he had been given an infirmative within his body”.. Being a christian I am aware that God tells us to not only be hearers of the word, but be also doers of the word also. Is this a vision from God to encourage him for loosing faith in God and to repent or is this a vision from Satan. All the words in his vision were words describing negative events that is to come. What do you think? Vision sent from God or Satan. Here is the bases for determining what is a vision from God. God’s visions will be truth while those from Satan will be lies. God’s Words are Always TRUTH. The more we know the TRUTH of GOD in His Word the more likely you are to recognize a vision being from the LORD. No vision will ever contradict any WORD OF GOD. One interesting point is what you said about being a hearer of the word and not a doer. This is a Bible verses and this represents TRUTH. I would say this is a vision from God and not from Satan since Satan would never tell anyone to do the Word of God because this will put Satan under their feet. Thank you for you comment and question and God Bless you. VERY INTERESTING BLOG. I AM A CHRISTIAN OF FAITH OF JESUS CHRIST. I DO HAVE MY FAULTS N SHORTCOMINGS, BUT WILL ALWAYS STAND AS A BELIEVER OF CHRIST. IM NOT A PERSON WHO IS MUCH OF A READER, NEVER HAE BEEN, BUT I DO READ SCRIPTURE WHEN MY MIND DOESNT FEL LAZY, BUT IM A CONSTANT PERSON IN PRAYER. A STRONG PERSON WHO BELIEVES THE SAYING “THERE IS POWER IN PRAYER”. SINCE 1997 TIL JUST LAST NIGHT I HAVE NOTHING BUT SPIRITUAL DREAMS, ALWAYS. ITS ME ALWAYS BATTLEING AGAINST DEMONS. ON LIKE 3 OR 4 OF MY VISIONS GOD SENT ME ANDA COUPLE OF GUYS TO HELL TO RETRIEVE SOMETHING, DONT KNOW WHAT IT WAS. MISSIONS WAS FAILED BECAUSE OF AN DISOBEDIENT PERSON IN MY SQUAD SO TO SAY. GOD PUT ME IN CHARGE. IN THAT SAME VISION I WENT BACK TO HELL, WENT INTO SATANS SLEEP ROOM, SEEN HIM SLEEPING WITH 2 BEAUTIFUL GIRLS. SEEN HIS BED SIDE STAND, OPENED IT UP, REACHING FOR WHAT EVER I WAS TOLD TO GE, I FELT IT, GRAB IT, DREAM OVER. MANY VISIONS OF JUST FIGTING THE DEVIL. THE THINGS I NOTICE THAT IM NEVER SCARED, IT ALWAYS SERVING GOD, AND I ALWAYS COME OUT VICTOR. THE FIGHTS SEEM SO REAL. AND THE ONE VISION I HAD I WAS CARRYING ABOUT 7 DOVES IN A CAGE RUNNING FOR M LIFE CAUSE THERE WERE DEMONS RIGT ON MY TAIL WITH RAZOR SHARP TEETH. THE CHASE ENDED. IT GOT BLACK. A VERY GLORIOUS, RADIANT MALE WITH ALL WHITE N RED EYES, FIRE (REVELATIONS 1 VERSER 14), HE SAID, I BELIEVE, I MADE IT. WALKED DOWN THIS CORRIDOR WITH THIS MALE, ANGEL, ABOUT 15 FEET IN HEIGHT. DOORS OPENED, AND I SEEN PEOPLE EVERYWHERE, IT WAS SO BEAUTIFUL, WITH A STREAM OF WATER DIVIDING THE HILLS THAT PEOPLE WERE SITTING ON. I WALKED I LOOKED TO MY RIGHT AND I SEEN MY GRANPOP, GRANMOM, AN UNCLE I BELIEVE, MY MOM AND SISTER. MY GRANPOP DIED FIRST. MY GRANMOM 2 YEARS LATER. TWO OF MY UNCLES NOW ARE IN VERY BAD HEALTH, MY MOM AND SITER ARE STILL ALIVE. I CAN SHARE MUCH MUCH MORE. THESE VISIONS FRUSTRATE ME N I BELIEVE KEEPS ME IN A STATE OF BEING LOST WITH GOD. IF I ONLY COULD KNOW WHAT THEY MEAN I BELIEVE I COULD BE A BETTER CHRISTIAN. THANK YOU. Thanks for taking the time to study the Bible with me. God Bless!